This 2016 book, by two Southern Seminary professors and eight other writers, explores the new challenge to traditional Covenant Theology. 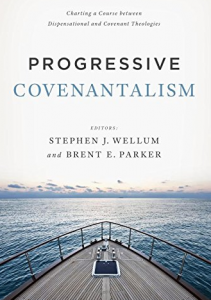 There are ten chapters, or topics, discussed but Brent Parker’s chapter on “The Israel-Christ-Church Relationship” is the clearest section of the book in defining just what Progressive Covenantalism is. He writes, “Progressive Covenantalism argues that the biblical covenants and typological structures converge and climax in Christ with entailments for the eschatological people of God—the church. . . The NT presents Jesus as the fulfillment of Israel and all the OT covenant mediators, for he ushers in the promises to Israel (restoration and return from exile, the land, etc. ), embodies their identity, and completes Israel’s role, calling, and vocation” (p. 44). Also, “The case will be made that Jesus is the ‘true Israel’ in the sense that eschatological fulfillment has come in Christ as he embodies the identity, vocation, and prophesied roles of corporate Israel.” He then admits, “Such terminology is frequently attacked in dispensational circles” (p. 53). Therefore the “progress” from traditional Covenant Theology is to see Israel’s promises fulfilled in Christ Himself rather than in the church per se. But also, the use of allegory and typology remain prominent in Progressive Covenant Theology. Parker again writes, in a section titled “The Nature and Importance of Typology,” “Typology is the study of how OT historical persons, events, institutions, and settings function to foreshadow, anticipate, prefigure, and predict the greater realities in the new covenant age. . . Typology really belongs in the category of indirect prophecy because the fulfillment wrought by Christ brings to completion what the OT type prefigured” (p. 48).